In this article we intend, from a strategic point of view, to strengthen the integration role of all the different systems of an hotel, as this is the main challenge for the future of a THRO system. The greater the integration degree of the multiple hospitality systems, traditional or new, the greater the use of data in favour of the hotel organization competitiveness. Nowadays, there is a lack of use of all the technological components already existing within the organizations, either due to lack of configuration or lack of knowledge, the fact is that the use of existing data is almost nil. Hotels and various accommodation properties are now major wasting centres of valuable data on their guests and potential clients. This phenomenon is mainly felt in small and medium-sized properties, which are referred to as independent properties, not belonging to any chain. It is estimated that in small or medium-sized properties we can lose around 600€ to 1400€ per day, due to the waste of existing resources. For example, all properties have a PMS, whether big, small or medium-sized, however, how many are able to extract sales by market and distribution channel? How many really know who their guests are? How many can make a sales forecast per channel? These are the questions that can be answered immediately if the PMS is well configured and parameterized. However, few are the independent properties that are able to give these answers with accuracy and security. Another issue that can be easily solved is the costing system of the properties themselves. Most of them already have ERP information systems integrated with their accounting systems, however, very few use their integrated system with their existing PMS, what often creates disparities. One of the things that they can easily do is the systems integration through API's and the use of the USALI system (uniform system of accounts for the lodging industry) specifically designed for hotel properties. With this system in place, many issues that PMS’s have some difficulty in answering could easily be met if there were a correct use of the costing system. 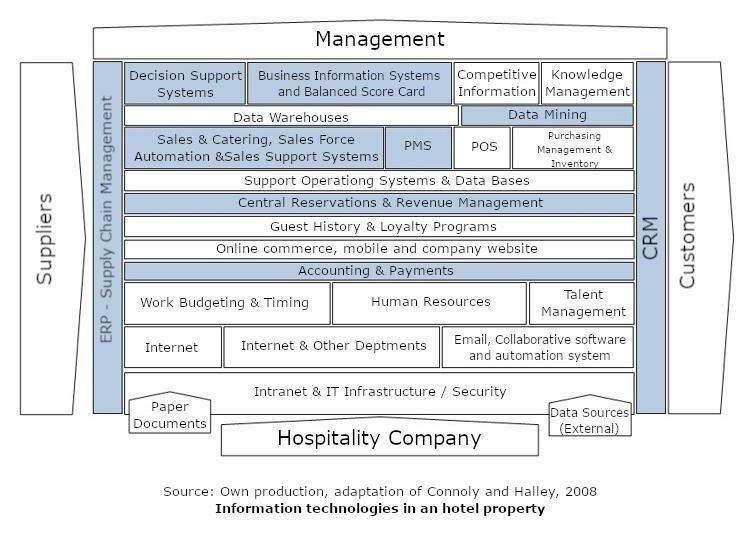 The following table intends to make a summary of all the different systems and their relationships within a medium-sized hotel company, however, there are some that are primordial and should be integrated for a correct implementation within the THRO system, or we should think about taking steps towards its integration. Due to their great relevance, identified in blue for easy identification and reading, these are: the ERP that must be properly configured with the USALI system, accounting or finance, central reservations, revenue management, sales, PMS , data analysis, BSC systems, and decision support systems for management. This flow, in addition to the others that are also important, are determinants for the correct information flow to the board towards the decision making. The results of, for example, an integration of hotel management software with an ERP translate into significant gains because they allow hotel properties to obtain information to support management and decision-making in a timely manner. Thus the productivity in the hotel properties increases, reducing administrative costs. On the other hand, management can distribute all information horizontally across all organization, making business processes and decision-making models more rational. In this way, hoteliers can have a global view of their reality, either of the whole operation, whether the entire financial and accounting aspects. There is a multitude of system data that hotel properties are wasting, so that all this information becomes useful we must be careful so that this data can be extracted in a reliable way. When all the information, from multiple sources, are connected with an integrated system, we gain the possibility of working with data in real time and not estimates or assumptions. Its correct use results in highly qualified and useful information about the accommodation property, either an hotel, hostel, motel or local accommodation. Crossing these synergies will allow employees to save time effectively. For example, employees who only inserted reservations in the PMS, with the automation of this processes, can now proceed to the analysis of data standards and make decisions based on this data in a reasoned way. All the time that the employee wastes in inserting reservations and performing its treatment, can now be used to put together a strategy to improve the hotel's revenue management. They can now plan when to raise or lower a rate, actively manage channels and allocations of availability, plan packages, assign promotions to specific dates, choose partners, etc. Employees are fundamental to the development of the entire system and management of a more efficient technological system, contributing decisively to the creation of more revenue. In practice, a better system and more system integrations means higher return to the hotel, an increase in revenue and efficiency in the Revenue Management strategy. With a continuous flow of information across the whole property, in several information systems, it allows a much more personalized service to the guest, since there is a greater degree of collection of data about this in a precise and systematic way. By simplifying the administrative process, it allows us to pay more attention to the guest and to make a greater service customization. This can mean an after departure email thanking for have chosen us, a personalized message or a reminder with a suggestion of an additional service. This allows a higher guest satisfaction by raising reputation ratings. Only this detail, by itself, exerts a positive pressure on prices. With better integrations, the hotel has direct and indirect gains in operational efficiency. Employees, who are one of the hotel's most expensive resources, have more time to perform tasks that add value to the project. With a quality database, which is a difficulty in the hotel industry, we managed to generate a revenue increase of about 45%. Employee participation is essential, we need extra care when filling in guest data. Without the correct insertion of the guest's basic information, it is very difficult to personalize his stay, this is a great competitive advantage in the differentiation battle between accommodation properties. The integration of information systems ensures that all information is entered correctly and properly classified from the beginning of the reservation process, enhancing the revenue increase. In this way, we highlight its real importance, however, it should be remembered that the data only becomes useful when it is used to create a higher revenue. This means that we must extend it to all sectors.